Matthew has published academic and popular literature for the BBC, Journal of Biological Conservation, Marine Policy Journal, Earth Island Journal, World Watch Institute, United Nations Environment Program, United Nations Peacebuilding Commission, One Earth Future Foundation, U.S. Department of State, NOAA Research, Boulder Magazine, Mantra Magazine Yoga + Health, among others, as well as given talks around the world. He is a Featured Author and Columnist with the Elephant Journal. You can purchase books he’s written, or contributed to, on his Author Page with Amazon. You can keep up with his writing on his blog, or subscribe to his RSS feed via the Elephant Journal where you’ll find his writings on the environment, sustainability, music, international affairs, politics, yoga, conservation, social and environmental entrepreneurship, travel, philosophy, culture, arts, and spirituality. King, Matthew Wilburn. (2009) Political Ecology of Mangroves in Southern Honduras: Emergence and Evolution of Environmental Conflict in the Gulf of Fonseca 1973 – 2006. King, Matthew Wilburn; et al. (2016) Environmental Governance and Peacebuilding in Post-Conflict Central America: Lessons from the Central American Commission for Environment and Development. Series: Strengthening Post-Conflict Peacebuilding through Natural Resource Management, Volume 6: Governance and Institutions – Confidence Building (edited by Carl Bruch). United Nations Environment Program (UNEP), Environmental Law Institute (ELI), University of Tokyo, and the Specialist Group on Armed Conflict and the Environment of the IUCN Commission on Environmental Law. Earthscan Publishing. 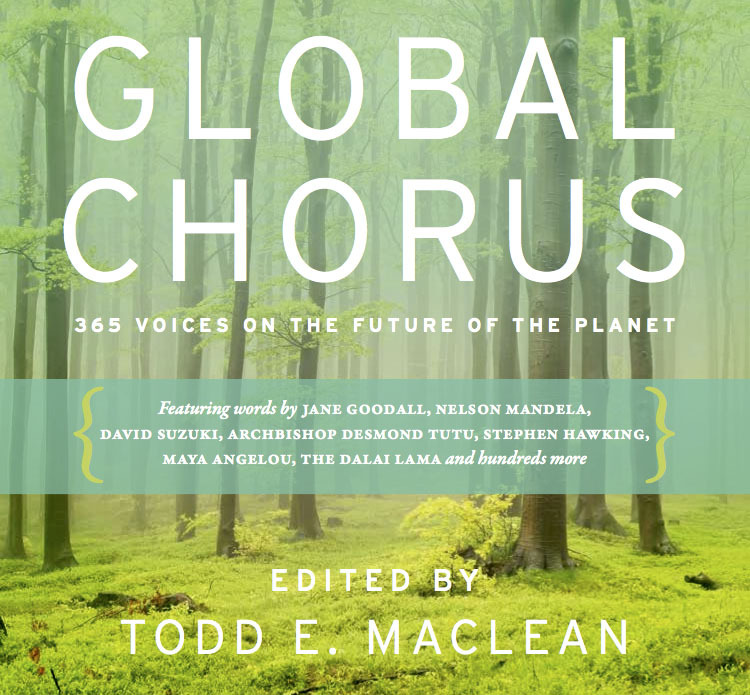 King, Matthew Wilburn (2014) “Global Chorus: A 365-Person Anthology of Worldwide Concern and Enduring Hope”. Victoria, BC, Rocky Mountain Books. Seyle, Conor; King, Matthew Wilburn; (2014) “Understanding Governance,” in Worldwatch Institute, State of the World 2014: Governing for Sustainability. Washington, DC, Island Press. pp. 20–28. King, Matthew Wilburn (2014) “Can Networked Governance Help?” in Worldwatch Institute, State of the World 2014: Governing for Sustainability. Washington, DC, Island Press. pp. 36–37. Wilburn, Matthew et al. ; “Sea Grant in Latin America: Adapting the U.S. Sea Grant Model of Linked Applied Research, Extension, and Education to a Latin American Context – is there a fit?” Marine Policy Journal, May 2007, Volume 31 (3) Elsevier Publishing. Wilburn, Matthew (2003). Watershed Management. Civil-Security Forces Environmental Cooperation in Central America and the Caribbean Conference Report; pp. 20-23, Belize City, Belize, Center for Strategic Leadership, United States Army War College, Carlyle, Pennsylvania. Wilburn, Matthew; Tobey, J; Hepp, J.; Olsen, S.B. ; Costa-Pierce, B.; (2004) Sea Grant International: Final Report to the Department of State, Oceans Environmental and International Scientific Affairs Initiative Grant IAA#S-OES-03-IAA-001. United States Department of Commerce, National Oceanic and Atmospheric Administration, Oceanic & Atmospheric Research, Office of International Activities in Collaboration with the University of Rhode Island Coastal Resources Center. July. Wilburn, Matthew; Tobey, J; Hepp, J.; Olsen, S.B. ; Costa-Pierce, B.; (2004) A Network of Centers for the Governance of Coastal Ecosystems: The Establishment of Long-Term University-Based Marine and Coastal Resource Programs in Latin America and the Caribbean. Government White Paper: United States Department of Commerce, National Oceanic and Atmospheric Administration, Oceanic & Atmospheric Research, Office of International Activities in Collaboration with the University of Rhode Island Coastal Resources Center. March. Wilburn, Matthew; Tobey, J; Hepp, J.; Olsen, S.B. ; Costa-Pierce, B.; (2004) An Assessment of the Sea Grant Program Model of Extension, Education, and Applied Research in the Marine and Coastal Environment, A Revision of International Experience and Opportunities: Background Paper #1 Government White Paper: United States Department of Commerce, National Oceanic and Atmospheric Administration, Oceanic & Atmospheric Research, Office of International Activities in Collaboration with the University of Rhode Island Coastal Resources Center. March 2004. Wilburn, Matthew; Tobey, J; Hepp, J.; Olsen, S.B. ; Costa-Pierce, B.; (2004) Integrating Education, Applied Research, and Extension; A Justification for Pilot Projects in the Gulf of Fonseca and Coastal Ecuador: Background Paper #2 Government White Paper: United States Department of Commerce, National Oceanic and Atmospheric Administration, Oceanic & Atmospheric Research, Office of International Activities in Collaboration with the University of Rhode Island Coastal Resources Center. March. King, Matthew Wilburn (2013). “Addressing Corruption in Development,” One Earth Future Foundation, Broomfield, CO, July 17. King, Matthew Wilburn (2013). “Residential Fellowships Program Development,” One Earth Future Foundation, Broomfield, CO, June 13. King, Matthew Wilburn (2013). “Food Security: will the global population run out of food?” One Earth Future Foundation, Broomfield, CO, February 20. King, Matthew Wilburn (2013). “Solving the Globalization Paradox: toward an evolutionary theory of governance,” One Earth Future Foundation, Broomfield, CO, January 31.
politics, yoga, conservation, social and environmental entrepreneurship and innovations, travel, philosophy, culture, arts, and spirituality.